Steve: According to a comment at Lewandowsky’s blog operated by the University of Western Australia, Lewandowsky’s moderation is being done by (presumably) members of the SkS squadron, who were merely trying to silence Fuller as a commenter on the blog, stating that their liquidation of the history of Fuller’s comments was an accidental by-product of silencing Fuller. This entry was written by Stephen McIntyre, posted on Sep 15, 2012 at 1:05 PM, filed under Uncategorized and tagged lewandowsky. Bookmark the permalink. Follow any comments here with the RSS feed for this post. Both comments and trackbacks are currently closed. Can something be both outrageous and hilarious? This is…. Orwellian re-writing of blog comment history at STW. The “unreliable” John Cook/SkS team strikes again. There’s no need to snip comments like that one. People are used to numbering getting screwed up because of comments disappearing. What’s more interesting is how many comments refer to Fuller or his comments. Anyone who looked closely would probably suspect what had happened. Well yes, unless absolutely nobody responded, quoted or requoted Mr Fuller; or indeed made no new post referencing his posts and using his name. Isn’t this going to mar the flow and auditability of comments and give the impression that someone is making stuff up as they go along? I participate in various forums and most wouldn’t suffer from comments disappearing. Though of course people who frequent Skeptical Science accept it as normal. Skiphil, get out more often. You might get under this guy Lewandwsky’s skin! Can you imagine the uproar if the situation was reversed? Any bets that the originator is short skinny and spends large amounts of time on “‘Warcraft” or “Call of Duty”. Anthony there was a similar situation with Moonbiot over what was clearly a Joke and nowhere near the bile of that set of comments, he made a national issue of it in his Blog. I guess one might say that Füller’s comments were liquidated by the SkS. Perhaps as a hommage to Dr. Lew becoming Dr. Who (as in “Who posted that?…), a very Dalekian “EXTERMINATE!! !” regarding the comments would be appropriate? MAny other explanations are possible. They could have been vaporized by the missing heat, drowned in the sea level rise, eaten by the sky dragons. Oh Steve – that’s not fair! You disappeared my “Tomorrow belongs to Steph” post. suggest replacing misinformation by presenting simple and brief messages that focus on the new, correct information rather than on the incorrect information. When correcting misinformation, provide an alternative — but accurate — narrative of events to fill in the gap left when information once thought true is found to be false. Individuals’ pre-existing attitudes and worldviews can influence how they respond to certain types of information, so those trying to counteract misinformation should consider the specific views and values of their target audience. Am I the only one who finds it somewhat curious that this (far less fanfared) paper appears to have actually made it into print whereas Lew’s back to the future “recently published … forthcoming” shoddily sensationalist survey “results” have not? That could just be the natural delays in the publication process – unless the Editor discovered these audits. It would be most fascinating if the Editor had the courage to invite and publish a followup/parallel paper by the auditors. Steve: it is the authors’ responsibility not to use fake data. No one should be put to the trouble of responding to fake data. Have Lewandowsky and Gleick every been seen at the same time? Like twins separated at birth. Use of the word pogrom is much too inflammatory, and probably offensive to people whose families fled Russia to escape the pogroms. Reasonable discourse should avoid the use of emotionally charged terms (e.g. Al Gore’s “environmental kristalnacht”) would fall in the same category. Steve used pogrom in the text of a post last week. It bothered me on both occasions. I agree it’s a step towards godwin’s law and that bothers me. But also because it’s a mis-useage. The word applies to attacks on Jewish people and other ethnic minorities, but not blog posters. Steve: “Pogrom is a Russian word meaning “to wreak havoc, to demolish violently.” ” http://www.ushmm.org/wlc/en/article.php?ModuleId=10005183. I submit that the usage is apt. Yes it is inaccurate. It is specifically the mass murder of Jews or other ethnic groups. The deletion of a blog post is not equivalent to the killing of a person. Apparently you’ve never seen Monty Python’s Cycling Tour episode (one of their best). Oops, the link didn’t go. “pogrom” is approximately synonymous with “genocidal massacre”. Are you sure that’s the word you want to use? tend to agree with that – do not give people sticks to beat you with and distract. I condemn the use of the term denier, ecological holocaust, and all such ridiculously hyperbolic locutions. I don’t care how the other side react to the use of “pogrom”. I think that its wrong and that it does you and this blog a disservice. pogrom = holocaust Use at your peril. How about research by Twitter? 😉 ! BUT, a quick analysis of how many ‘sceptic’ twitter followers SkS has could be fun… Could even tweet them to ask if they took part in the survey..
Steve: Nice spotting!! I snipped a little at the beginning to not distract from an excellent find. I doublechecked and there is nothing at SkS on August 27. I presume that the link was to kwiksurvey. The link goes to kwiksurvey, survey#HKMKNG_ee191483, which is the one posted at IllConsidered & Bickmore. That nicely reconciles Cook’s reply to Lewandowsky that he had posted a link to the survey, with the absence of a survey post in the Wayback Machine’s archive of SkS posts from that period. Has is that a confirmation? Posting the link on twitter is not the same as posting it on the SKS site. Lew’s “methods” as stated in his paper is wrong since the survey was posted on twitter (not a blog) PLUS it was retweeted by 5 people. Is there a way to find out who retweeted on twitter? Fer cryin’ out loud–never heard of a metaphor? Can anyone give us the definitive answer on this? I suspect it may be a doozy of a stick to beat Steve with. I may be being hypocritical here but Tom Fuller’s comments seem to me to be have been kind of fractious and not constructive anyway. I am of the simplistic and simple minded philosophy that thinks all comments should remain on all blogs for all time, but when rules or even some emotional/psychological filter system is implemented why be bothered by their application when some other more overriding point is more important? tlitb1, I’d had no problem with most of the moderation I saw applied to Fuller’s comments. He brought plenty of it upon himself, and if the moderators had decided to delete his comments rather than snip them, I’d have understood. The problem isn’t that his comments got deleted. The problem is they got deleted now. Why wait several days to delete comments? Why delete comments days after you edited them for moderation reasons? Going back and secretly deleting every comment from a user, despite having already moderated those comments, is dishonest. Okay that is interesting I saw some of his comments get edited in real time virtually since I was being a bit obsessive and following the “Shaping” blog for activity. I didn’t realise there was some issue of a block removal at a later time. Probably needs to be better stated? Steven thanks for the call-out. I’m not sure I’m the only one honored in this fashion. tlitb1, I did get a little snarky. In my second to last comment I mentioned that scientists who wanted to advocate for a political position should feel free, but that when that political advocacy interfered with their science it was not a good thing. However, I specified that I didn’t think that it would lead to changing answers–but that it would change the questions they asked. In one of my first comments I used the phrase ‘research misconduct’, which they let stand for quite a while. And I snarked back to Eli Rabett right at the end, which is when they removed me bodily from all threads–after fixing a typo in Eli’s post, no less. Professor Lewandowsky has made no attempt to address these questions. I do not style myself an expert, but I am a ‘seasoned veteran’ of online research. The first online survey I worked on was in 1996 and I’ve done more than a thousand since. I’m willing to repeat the phrase ‘research misconduct’ now. I have no doubt that Professor Lewandowsky did his sums correctly in linking skeptics to his constructs. But he got bad data from phony respondents, didn’t have enough answers to justify his tortuous reasoning and has been hiding those two facts for two years. He is not, in my opinion, like Peter Gleick. He is very much like the authors of Anderegg, Prall et al (PNAS 2010) in trying to ram through shoddy science and hoping nobody will notice. Actually, Professor Lewandowsky, while randomizing responses within a question is standard practice and could go unmentioned, using different iterations of a survey with differently ordered questions is unusual enough to be mentioned in the methodology description. You should have done so. In the age of the internet, researchers have acquired the habit of posting study elements online to provide answers to just the type of questions you are receiving. I think you are remiss by not posting the different iterations of the survey online, labled by which blog fed them. How does one post an image? What happened to the post about you being blocked from accessing Lewandowsky’s site ? Also, I wholly agree with jfk. Your use of the word “pogrom” is unnecessary. One of the problems with Lewandowsky’s paper and conduct is the use of sensationalist language. You ought not to repeat the mistake. Difference between Skeptical Science (or is it?) and ShapingTomorrowsWorld. Any Australian readers going to complain? ie he gets lots of mentions, ie ‘warmists’ saying how wrong he is, but all his original comments gone. thomaswfuller @20, I didn’t believe anybody would fall into this trap, but apparently someone did. Yes, more warmists believing in conspiracies than skeptics – because there are more warmists overall. 30 is now someother chap!! Oddly, Lew and company did not disappear my posts on his Sistah Souljah peice….too much…a few snips, mostly of snark. The worst case of censorship I have seen, is that of Jason Box, on criticizing the FKM2011 paper on Greenland. He nuked the whole post. Box was unhappy that the 2010 data was not used, in spite of the fact the authors did not have the 2010 data when they wrote it. I asked Box if he would also be critical of Santer2008 and Hansen2001 papers, which did not use the full data set, and the results changed if they did. He simply left my responses in moderation, which I could see as being in moderation. Eventually, I was able to post by being tricky with the references. He put some of those back into moderation after they were public for a day. But, as there were obvious gaps in the dialog, and my posts were still visible at least to me, and had been public for at least a day, he erased the entire post. I suspect that the erasure also had something to do Chip Knappenberger’s reasoned and polite replies to the criticism by Box, even though it was at the start of the conversation. Maybe Box finally read Chip’s reply, after a month. Following in the Master’s footsteps, Steve M, I printed the entire post to PDF, before he deleted it. Michael Tobis did that to me, once. Nuked a post. Ive lost count of the number of times Ive left comments on climate skeptic blogs and they’ve just disappeared in moderation. Not CA I should add. Steve, Can you show the deleted comments? I think given the current controversy it would be wise for Steve to redirect snipped comments to some kind of “against blog policy” thread just for archival purposes. But I don’t know whether he has that ability? SkS & Lewandowsky’s blog are populated by the same crew doing the posts. Why’s anyone surprised that they operate the same censorship methods? Phil Jones- Cleared of any wrong doing by Oxburgh, Russell, and the Nouse of Commons Sci committee. Michael Mann- Penn State rules no wrong doing. Steve Lewandowsky- Will be exonerated by UWA. UWA SHOULD hang their head in shame. This is extremely unethical. Lewandowsky now has a responsibility to make it clear in the blog that the discussion has been censored in this way i.e. to remove posts which he believes put forward factually incorrect information or poorly reasoned criticism. I think its fair to say that the default assumption of the vast majority of readers who stumble upon the blog that the discussion represents the opinions, praise and criticism by readers and not a distorted version supporting the author’s position. That assumption clearly doesn’t hold now. Lewandowsky should make that clear. I’m a Jew of Eastern European ancestry and I have no objection to the use of the metaphor which is aptly applied to a specific action. It does not belittle the history of actual atrocities to apply it in this case. I could come up with a string of vile adjectives to describe the close-minded and integrity-free behavior of Lewandoofus. And while I can’t speak for all my people, I do tire of the overly sensitive reactions of the “PC” world we live in. And to preemptively answer the obvious replies about the use of “denier”, the difference is the use of the word denier is a blatant attempt to marginalize and cast as evil an entire side of a debate, grouping together and dismissing people of vaguely parallel opinions as less than human, and thus avoid any actual engagement. Not the same. Not the same at all. Brilliant. Thanks for saying this. My thoughts entirely. Ha, my comment made in the same minute Steve bowed to others and made the change. I support that too. The precise language and metaphor doesn’t matter to me. The total lack of ethics with which certain players operate is the issue. But thanks again J.
Oh dear, I was being PC? Not something I usually try to do. I posted to try to be helpful. I thought Steve might not know what the word pogrom typically referred to. At any rate he does know and says he is comfortable with the usage, so I withdraw. Ah, too late, Google has updated the cache. I’ve made local copies, let’s if I can upload them somewhere. Tony, thanks very much for this. I have reviewed all my comments there and in retrospect I don’t see a legitimate reason for airbrushing me out of the history of this conversation. I’d really appreciate it if someone would double check and see if I’m just kidding myself. Preferably someone from the consensus side. I don’t think that users of the term “denier” are in any position to complain about the use of the word “pogrom”. Nonetheless, I will defer to readers on this point and have amended to the term “Cleansing”. People complained some time ago when I started shortening SkS without the k, because it was the same abbreviation as wartime Germans you-know-what. Thank you! Apart from the fact that deleting blog-comments does not qualify (IMHO) as a “violent” act, to the extent that the pogroms in Europe preceded (and some might say prefigured) the Holocaust, your use of the word in these posts struck me as being somewhat anachronistic (and, as a Jewish person whose family tree includes too many branches severed by pogroms, somewhat uncomfortable). Were I at your keyboard, I think I might have chosen to use something along the lines of “Lewandowsky’s ludicrous discussion distorting and self-serving acts of comment-purging”. The two terms are not equivalent. Whenever someone has called me a “denier”, the context has always been clear in my mind. It is a shortening of “living in denial”, a reference to 5 stages of grief, insinuating that I am rejecting a diagnosis because it’s implications are too awful. I’ve never personally taken it as an insinuation of repudiation of well documented history because of conflicting ideological convictions. Still pejorative, and somewhat dehumanising, but not Godwin-esque. I was also ignorant of the definition, and beforehand would have said cleansing is inadvisable, as it is similar to ethnic cleansing. The moniker SS is not a problem given the discussion they have in their forum of their preferred actions against skeptics. Either time has gone non-linear, or post #100 refers to post #101 for some other bending of reality. Moderator Response: Mr. Fuller found compliance with the comments policy too onerous a burden and has recused himself from further discussion. His comments were then excised from discussion as well; references to other comments via numbering may thus be off. For the record I say NO post from Tom that was remotely out of line. His were generally some of the most straightforward non-inflammatory there. ‘has recused himself’? In plain English, someone recuses themselves voluntarily because of a conflict of interest etc. There is no connection whatsoever with having all their posts deleted by an an anonymous ‘moderator’. Indeed, this blog post is libelous. He didn’t recuse himself. They are writing it that way, saying he caused his removal from the board through his behavior. You wouldn’t say someone dropped out of school if they were kicked out for violating the honor code. Could have sworn when I read the link on Tom Nelson’s page, it said ‘pogrom’…. Well basically you were always snippy as I remember with approaches such as “why did you ever think this would work…” – a characterisation that may be negotiable? I think you’ll find it’s “manor” meaning territory. I hadn’t been paying the Lewandowsky stuff much mind, but based on this post went and read the most recent thread. I do feel that there is a much more basic objection, that regardless of who said what it is poor empirical methodology. “Just a quick read here shows Lewandowsky et al in its claims goes well beyond the limits of the non-random two tier sample selection and subjective classification of blogs. It says something about an idiosyncratic collection of respondents, but frankly nothing generalisable based on usual methodological standards. “I’m surprised Psychology Science accepted it. There’s a website called the “internet wayback archive machine” that lets you put a link in it and then it preserves that page contents of that link so you can go back and view it exactly as it was when you submitted the link. Too bad this wasn’t done for any of his blogs. you need to hover mouse over link in the tweet.. I have emailed you a screen capyure. to be more specifc, click on the survey link in the SkS tweet. Actually it was two tweet thst I found and posted yesterday. My post is at the bottom of the SKS Link thread. I have another post, stuck in moderation for a day, that shows that there were actually 2 tweets from John Cook. as generally only ‘warmist’ follow Cook, how many sceptics took the survey. 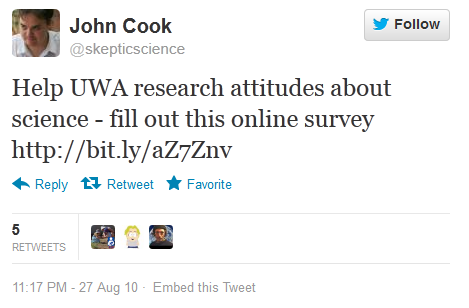 The few sceptics that follow Cook (I do) can just be asked if they did the survey..
There’s a great tool, snapbird.org, that does a great job of going through older tweets. The search engines of google and twitter only look back about 1000 tweets. John’s a proflific tweeter (twit?) with over 3,100 tweets. And for the record I’ve got seven rather effect tweets. Both Peter Gleick and Michael Mann have blocked me. For what it is worth, I was also snipped at Lewandowsky’s “Nasa faked the moon landing” piece and of course a response by another reader to my comment now makes no sense. I don’t think I said anything inflammatory. I only suggested a comparison between lobotomies and ghg regulation, and how prevalent lobotmies might be today if the only justifcation for their continued use was a survey of those who felt they were a great treatment. Steve: the issue isn’t snipping. It’s after-the-fact rewriting blog history. I object to the use of the letters SKS as a applied to a crackpot website thereby denigrating a perfectly durable Soviet era Russian firearm. Hmmmph. I think you did yourself and others a service with the wording change. Regardless of whether other people have a “right” to complain, they will complain, and this derails any attention to the substance of your arguments. Does anyone recall what Lewandowsky’s UWA stands for: is it the University of West Anglia? Lewandowsky’s UWA […] University of West Anglia? Steve, that’s not fair – and you said it with such a straight face! And the first file is called amnesia1.htm. That’s the kind of deadpan humour that has made this blog famous. cute! WUWT regularly deletes comments during moderation without any announcement, and one of its commenters is probably a sock-puppet for a moderator. Where is your thread of outrage on censorship in the skeptic blogosphere? To “mod”: I now know that you have been hanging around at Shaping Tomorrow’s World, as it was over there that you were alerted to this comment being trapped in the spam filter (haha). So now it is also clear that the proprietor’s of this blog have been informed about moderation policy on STW, and are aware that a) Lewandowsky didn’t snip anything b) Lewandowsky is not hte moderator of his own threads and c) the deletion of all Tom Fuller’s comments is a flaw of the moderation software used there, not a deliberate decision by the moderator. Are you going to amend this post to indicate that everything you claimed about the “pogrom” (stay classy!) was wrong? Or are you going to just let all the accusations made here stand, without informing the commenters reading this post that they are wrong? And it cannot be reversed? And human beings had nothing to do with it? In which case, has a public apology been made for this error? Well then Richard, I guess this blog owes me a public apology for throwing my previous comment into spam for 3 days? Since when did blog proprietors owe random strangers an apology for their choice of software? You really don’t understand blog software much. Spam-detection software functions before anybody sees a comment. And, for what it’s worth, here on WP.com we have zero control over any of the code that runs the site. That’s one condition of being hosted here. The Tom Fuller incident involves deletion of his posts after they were approved/visible to all. Please provide any evidence or example that this is a flaw of the software as you claim. AFAIK that can only be done as a deliberate moderator decision. Without further evidence, your claim is false on the face of it. I’m sure that many who read this blog are also now perusing STW. So what? I can guarantee you that dragging comme nts out of the spam trap isn’t the highest priority use of anybody’s time. And yes, I’m one of the moderators here (and one of those who helped build this site. Thank you BTW for your short, concise and (apparently) on-topic comment suggesting a different analysis approach. I’m not a statistician so I have no comment on your content. SO… let’s get back to the science! MrPete, it was you who was on the STW website, where you posted a response to my accusations of censorship, so I know you have seen the STW moderator’s reply to this post. In that reply the moderator makes clear that their software deleted all comments in the thread and that they have no control over this. 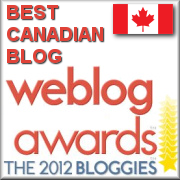 Are you accusing the moderator of that blog of lying? Is this another in the long line of accusations that this blog makes at anyone it disagrees with? Is this blog going to change the post to reflect the facts as provided by the moderator at STW? you are a moderator at this blog, presumably you have the ability to ensure that the posts on this blog accurately reflect the truth, rather than simply being a grab-bag of conspiracy theories. If you are going to claim that “without further evidence, [my] claim is false on the face of it” then I can say the same of you: without further evidence, how do I have proof that my comment was previously in spam rather than being deliberately withheld? Without further evidence, your defence is false on the face of it. You see how this game goes? Fix your post so it is accurate, rather than accusing others of lying. According to a comment at Lewandowsky’s blog operated by the University of Western Australia, Lewandowsky’s moderation is being done by (presumably) members of the SkS squadron, who were merely trying to silence Fuller as a commenter on the blog, stating that their liquidation of the history of Fuller’s comments was an accidental by-product of silencing Fuller. Accidental byproduct in the sense that apple juice is an accidental byproduct of the operation of a press. It’s possible that removing the comment permission from a user might delete all their comments depending on how the blog software was written. That is possible and the wholesale removal could have been inadvertant. For that not to be a known issue of which the moderation crew was aware is very sloppy if it’s actually true. Since I’ve been censored on this issue at Lew’s world while fautusnotes’s subseqent comments remain, I must continue this here. I looked for any comments held by faustusnotes in the moderation que at WUWT yesterday and there was nothing there. Still looking for evidence of his accusations. If true, looking for the reason, if false, well nevermind. And my last comment about moderation went into moderation. I wonder which word was the trigger? Steve: that is an extremely mealy-mouthed response. It’s not an inline comment, it’s a message from the moderator. Why should they be responsible for your egregious errors? I’m doing you the favour of auditing your work, and pointing out that you are wrong in all your particulars, so you should be a little more gracious than to accuse them of hiding things from you. You don’t know who the moderator is so saying they are from “the SKS squadron” is an assumption: please do note you’ve already been caught out writing a completely wrong post on the basis of a series of assumptions, so continuing to make them is probably not a good idea. Referring to the moderation practice as “merely trying to silence Fuller” when the moderator makes clear that he was given multiple chances to change his tone is also really cheap. Look around over there and you’ll see even the gentle Eli Rabbett gets the odd snip, and I was threatened with the same for discussing moderation practices here. Every single statement you place on this blog is intended to inflame suspicions of conspiracy and sinister dealings by people you disagree with, but in every case you are shown to be over-reaching or directly misrepresenting your victims – as in this case, where you were clearly caught out. Yet, you still manage to be snarky and bitchy in your responses, and refuse to admit when you are wrong. When you’re caught out as spectacularly as this, it would probably help your reputation if you offered a mea culpa instead of flinging more poo. Remember that Steve knows Tom Fuller and to a reasonable extent we all do, through his writings. Hardly a character to get riled and adopt a negative tone over something trivial. And given that this whole PR push began with a blatant attempt to smear those with whom Lewandowsky disagrees, with sceptics confused with lukewarmers confused with skydragons confused with Pielke Jr, so that all who differ in any part can be smeared equally, it’s rich indeed for you to cry foul on blog methodological grounds. I’m actually proud of the self-control of the assorted contrarians who have spoken up since this shameful paper broke out in the UK news on 27th July. As a result those that adopted this gutter psychology are looking increasingly foolish and inept. The smear machine goes on and on, as Tolkien might have written. Fortunately it’s effectiveness won’t. Wishing you a nice trip back to oblivion. No, I’ve not seen their moderator’s reply. You can be grateful I did notice your complaint about comments-in-moderation and took a few minutes to fix that. I barely have had time to skim this morning and see that you’ve written something here. Sorry, I’m a busy guy who takes a break every once in a while to help out. Currently on the road and not sure when I’ll have another chance to take a look. I’ve now looked at their statement about the comment removal. Your explanation is specious. Of course it is “software” that removes the comments. People can’t touch bits; only software can touch bits. But it was people who clicked on the choice to auto-block Fuller AND to remove his comments. There are other ways to accomplish the same thing. It was their choice to do it by means that removed his comments. This is not worth arguing over. faustusnotes, I personally believe your characterization of my comments is inaccurate. They’re here for your inspection. Perhaps you can identify which ones were inflammatory enough to justify my removal from the thread. That way I can learn. I really hate being rude unintentionally–so this is a serious request. I can snark with the worst of them, but AFAIK it has always been conscious and intentional. If I did it accidentally, I’d like to know. well MrPete, it looks like it’s you who doesn’t understand blog software. charles the moderator, you were warned clearly at Lew’s that further comments on the moderation policy here were off topic. That’s a warning I took – I didn’t comment further on the issue. As a result, your comment (which I saw when you posted it, FYI) was snipped. The moderators at STW are very clear about their reasons for snipping and deletion, and they gave thomas fuller (and you) multiple opportunities to abide by the comments policy. You may not agree with their definition of “inflammatory” or their objection to all caps, but they give clear warnings and police fairly. MrPete, the same response goes to your second comment: they gave Thomas plenty of warning and opportunities to change his tone and he wasn’t able to. It may not be your preferred form of moderation, but it’s what they do there and Fuller had the opportunity to abide by their policy. And no, it’s extremely difficult for me to “zero in on the science” when almost all of the posts here are straight-up conspiracy theories. Primarily, accusations that people gamed the survey without evidence. Remember, Mcintyre’s entry into this little game was his false assertion – made without proper research – that he had never been contacted for this survey. He’s built an entire edifice of conspiracy theories on that very soft ground and he hasn’t backed down. This thread has nothing to do with science, it’s about a post that contains a series of assumptions and misrepresentations about how Lewandowsky behaved. So no, “I can’t zero in on the science,” because there is none being done here. And don’t patronize me – Mcintyre’s said nothing about stats that I didn’t already know, and shown pretty clearly that he knows nothing about the social sciences. If you pay a little more attention to his critics, you might learn something about how deceptive and malicious his work is. Science is about truth. Lewandowsky does not seem to appreciate this even in blog comments. Lewandowsky’s fake results appear to be designed to strengthen support among journalists. However, if you google ‘lewandowsky’ ‘cognitive’ ‘psychology’ you (currently) see ~15,000 results whereas if you google ‘lewandowsky’ ‘fake’ you see ~20,000 results. Lewandowsky will be remembered as a fake. They never learn. Pavlov’s dogs, who learned after just a few attempts, would run circles around the Klimate Krew at UWA. Here is a complete list of known surveys. Two were distributed only to skeptic sites and the other three distributed to known warmist sites or within U. Western Australia. climate.uu-uno.org is part of what was previously listed as Trunity. Green Sand video. Yup, it’s a Groucho world alright. Ah yes Mr. McIntyre, Eli misses the many conversations on the Climate Audit Forum that have been cleansed so many years ago. That, of course, was not a recusal. At the time people simply stated that it was your blog and you had the final say but we do miss the discussion about \Miz w. Nick Stokes and others. Steve: Climate Audit has migrated servers a couple of times. I had no involvement with the forum, which John A set up. The server moves were not easy and, in one of them, the old forum did not move with the blog. There was never any wholesale and targeted disappearance of opposing comments in the heat of controversy. Whatever criticisms you may have of Climate Audit, I take particular care to let critics have their say on any topic at hand, as, for example, Hengist has recently observed. Talking about himself in the second person ? Now that is something to study. He always has… full of himself, actually. That wascally Wabett, doesn’t he know yet, tricks are for kids …. That is really unfortunate. It was a real resource. Hopping to conclusion again Eh Eli. BUT, on the articles by DANA, everys single comment removed…. he really believes in the exxon conspiracy, !! I had a quick look at some other Lewandoswsky blogs on his site and one caught my eye in which he was making the case that the larger the uncertainty surrounding an issue (like climate change) the more urgent the need to pay attention to the extreme ends of the spectrum of possibilities within the uncertainty band. This misunderstanding of statistics and decision theory in particular does not bode well for the standard or objectivity of the statistics he will have used in the current case. Having said that, the substance of the topic is interesting. Personally I would be curious to see some numbers about whether we sceptics are more or less gullible than warmists on such matters as belief in fake landings, illuminati, pyramidology etc etc. Of course one would need to see added to the list belief in supernatural interventions in the material world, or granting of sort of deistic sanctity to the Planet and the natural environment etc. Always interesting to know how well one fits into the various compartments that we construct for society! But clearly Lewandowsky wouldn’t be the man for the job. “The University of Western Australia should hang its head”: what, hang the Vice-Chancellor? Harsh! Someone mentioned somewhere about recovering passwords to Shaping Tomorrows World coming from SkS. So I registered and clicked the “I’m a prat and I forgot my password” link. Use of the term denier does make sense if properly defined. Lord May, Science as Organized Skepticism presentation, defines Affirmer and Denier as individuals who blindly support or blindly reject IPCC/climate science conclusions with little to no understanding. However, Lewandowsky construes it to mean Skeptics = Rejection of science/climate deniers. It also makes sense if the intent is to dehumanize people who disagree with your viewpoints, which is I’m pretty sure the sense in which it’s meant here. I agree, its commonly abused and intentionally used to fan the flames. Pogrom – completely irrelevant, since it’s now been changed, but my objection to ‘pogrom’ would have been that it’s the wrong word. ‘Purge’ would be closer in meaning to what was apparently intended, I think, but that doesn’t quite hit the nail on the head either. Any suggestions? Orwell’s 1984 uses the phrase “rectification”, but I’m not sure that this was ever applied to the Soviet era. The SkS mods would probably have it that they recused themselves. Re: Dave (Sep 16 12:03), “Purge isn’t bad.”??? Perhaps. The phrase is often used in conjunction with the use of the word enema. I can see it. Lewandowsky has the face that launched a thousand [snips]! In Lewandowsky's terminology, the fellow on the right "recused" himself. Re: Steve McIntyre (Sep 16 17:42), brilliant final answer! – “Science” redefined to mean whatever is considered scientifically orthodox, as transmitted by whatever scientific priest is currently anointed. No, science actually is a method of inquiry and discovery which may take you to someplace completely different from the orthodox position. – “Denier”, holocaust references aside, sounds like someone who refuses to accept the obvious. Absorption of IR radiation by certain atmospheric gasses is not obvious, and is not high school physics, it’s Schrodinger’s equation. Most users of the term denier could not explain how this works – rather they seem to believe that anyone who does not accept the ex cathedra assertions of authority and wants to inquire independently does not understand what “science” is. Or rewriting of history – 1934 gets cooler every year. Get rid of the Medieval warm period. Never point out that Camille and Betsy were more powerful storms than Katrina. Call a modest tropical storm that passes over NYC a hurricane – hardly anyone is left who can remember the 1938 hurricane anyway. Since it was Angstrom the Younger who described it, maybe all this dates back to the Medieval Ages, or even the Age of Rome. Can we also say that the blog and the picture were both doctored ? Rational thought is to be twisted to correspond with the lefts ideological fallacies. Comments that contradict the AGW “team” think will be eliminated. Only thoughts approved by the Party will be allowed. Farewell ter debate … oops… and down the memory hole! Say,Mr Lewandowsky, feel ok about that do yer?